In the history of wars Sri Lanka alone stands out as the nation that is charged with accusations for restoring peace. Of course, as in any other war, peace came at a price. It cost lives, no doubt. But the cost to human lives was far, far less compared to the colossal costs of ending wars (example: World War II) by the accusing nations. This is one of the most bizarre outcomes of the Vaddukoddai War. Sri Lanka was hauled up before the UNHRC almost the next day after ending the war. Not surprisingly, the anti-Sri Lankan post-war campaign is spearheaded by leading warmongers of the West whose record of observing International Humanitarian Law (IHL) in combating terrorists who threaten their national interests stinks to high heaven. Oddly enough, this campaign, led by US focused exclusively on the last few months – from January to May 2009 – of the longest running war in Asia. To be exact, the war ran for 33 years starting from the declaration of Vaddukoddai War in the Vaddukoddai Resolution of May 14, 1976 to May 19, 2009. India, “the strategic partner” of US, too joined in, focusing on the last months, to accuse Sri Lanka of violating “in particular international human rights, refugee and humanitarian law” as stated in the US-sponsored resolution passed by the 19th session of UNHCR, on March 22, 2012 in Geneva. The morality of focusing only on the last five months of a 33-year-old war defies all known logic and even common sense. “In Sri Lanka, the government was winning the war and victory was at hand. They had no intention of stopping. In January 2009, the government declared war. The call for the LTTE to accept an organized end to the war which included the LTTE handing over weapons, registering LTTE cadres and every single Tamil civilian supervised by international authorities at the UN, US and India, etc., was not heeded”, he recalled. The initial offer to surrender was made to the LTTE in November 2011 and, though talks were going back and forth on the terms and conditions, the LTTE eventually refused to “accept an organized end” (read: surrender) which would have saved tens of thousands of lives, as stated by Solheim. After the rejection of surrender it was clear to any sensible analyst that the LTTE was determined to fight to the bitter end even though it meant sacrificing the lives of innocent Tamil civilians caught in the crossfire. This places the entire responsibility of the deaths of the Tamil civilians, from the time the Tamil leadership declared war in the Vaddukoddai Resolution to its end in Nandikadal Lagoon, entirely on the Tamil leadership that relied primarily on a military solution. They painted themselves into a corner when they crept into the Vaddukoddai framework from which they could not get out. If, however, the LTTE accepted Solheim’s offer it is the Government of Sri Lanka (GOSL) that would have been cornered. The international community would have put unbearable pressure on GOSL to accept the surrender on the terms that would have been favourable to Prabhakaran. An “organized end” would have undoubtedly saved not only civilian lives but also the lives of the LTTE hierarchy. This would have tied the hands of the GOSL and given ample breathing space for the LTTE to regain its lost power not only to survive as a live political force in Sri Lankan politics but also to come back and fight another day. The Tamil leadership, as usual, committed hara kiri by refusing to accept a surrender. Prabhakaran “who knew nothing about the way the international community worked” (Solheim) was made to believe by the equally stupid Tamil expatriates, that the West would come in to save him at the eleventh hour. With no one coming to his rescue he was left to stew in his own juices. The situation was becoming very critical by March-April of 2012 even to his backers in the West. David Milliband, the UK Foreign Minister, is on record saying in the last days of the war that he spent 60% of his time on the Sri Lankan issue. He and his French counterpart, Bernard Kouchner, rushed to Colombo in April, 2012 to put maximum pressure on the GOSL to stop the war, all in the name of humanitarian grounds of saving lives of Tamil civilians. Pakiasothy Saravanamuttu, the double agent of Prabhakaran and the West, was running from one Western capital to another lobbying frantically to stop the war. Echoing his paymaster he was also blaming the GOSL for not stopping the war. As in the past, the Tamil leadership, intoxicated by their arrogance and intransigence, fell on their sword when they rejected out of hand the best offers they received from national, regional and the international communities. It was when the GOSL forces were on the verge of closing in on rag-tag cadres of the LTTE, that the international community decided to intervene on behalf of the LTTE. But they had no card to play short of putting boots on the land. This was going to be too costly, both in financial and human lives. Besides, the West was running out of body bags in the Middle East to spare any for another military adventure in Sri Lanka. Nevertheless, the West which did not bother about the civilian deaths for 32 years and 7 months suddenly woke up to civilian casualties only when they realised that the defeat of Prabhakaran would also mean the defeat of their interventionist role in Sri Lanka. Death of Prabhakaran also meant the death of Co-chairs and Erik Solheim. Collapse of Prabhakaran also spelt the collapse of the imperial role of the West. When Solheim was running the show for the West and India he did not exert the kind of pressure on the Tamil Tigers that was required to stop the war. Relying on the highly inflated capacity of the LTTE to win the war he took their side at every turn possible and pressured GOSL to concede the ever-increasing demands of the LTTE. Each time the Tamil Tigers walked out of negotiations on the flimsiest excuse Solheim and the I/NGOs backed the demands of the LTTE to pressure the GOSL to give into the next level of demands put forth by the LTTE with no guarantees of seeing the light at the end of the tunnel. Solheim too was happy to use Prabhakaran’s gun powder to force GOSL to concede more and more at formal and informal negotiations in Geneva, Colombo, Sattahip, Delhi and Oslo. Meanwhile, negotiations were not going anywhere because the attitude of the Tamil Tigers was that they do not need talks, negotiations, mediators, co-chairs or peace deals because they have the guns. Solheim too was happy to go along with Prabhakaran’s because the only way by which he could consolidate his position as an interventionist dictating terms to GOSL was by keeping the gun powder of the LTTE dry. Enhancing the political, legal and military power of Prabhakaran was a deliberate policy of the Norwegians to gain credibility and acceptability with the LTTE. For instance, in the first round of talks in Sattahip, the delegation sent by Ranil Wickremesinghe was forced to address Anton Balasingham as “Your Excellency” conceding that he was a representative of a sovereign State. Solheim even told President Mahinda Rajapaksa that Prabhakaran was a great strategist and the Sri Lankan forces would be defeated. The West was sold on the myth of the invincible superiority of the Tamil Tigers. Western diplomats were queuing up at the gates of Prabhakaran in Kilinochchi to pay their homage as if he was the Head of State. The diplomats were queuing up not to save the lives of Tamils, but to endorse and entrench the power of the cruellest killer of Tamils. Each visit of Western diplomats was read as an endorsement of the power of Prabhakaran to kill, destroy and dictate terms to GOSL. Not a single diplomat went to him with threats of hauling him up before a criminal court even though they knew that he had turned the Vanni into a fascist gulag. They knew that Tamil leaders like V. Anandasangaree and S.C. Chandrahasan had exposed Prabhakaran as the tyrant who had killed more Tamils than all the others put together. They did not threaten him with punitive action even after he had torn up the Ceasefire Agreement signed with the international committee. Instead they, their hired hacks in I/NGOs, the so-called defence correspondents in the local media, academics and assorted pundits were praising the might of Prabhakaran’s power that can be satiated only by appeasing him. The West began to raise the stakes only when Prabhakaran was losing. It was only in the last days and in the post-war period that the West and their agents used human rights as a political tool forcefully to tie the hands of the GOSL. Of course, there were lukewarm moves earlier to rap him on the knuckles with a wet rag. The former Under Secretary General of the United Nations/Special Representative for Children in Armed Conflict, Radhika Coomaraswamy, for instance, named and shamed him in the Security Council. But like all other responses to Ms. Coomaraswamy moves in conflict zones, Prabhakaran did not care two hoots to her predictable and theatrical act. In this battle to save children Prabhakaran won and Ms. Coomaraswamy, had nothing to offer the Tamil mothers, her own kind, grieving for the loss of their children except a useless bit of UN paper. She is typical of the international bureaucrats wringing their hands in public with no substantial solutions to the problems faced by humanity in contemporary times, except to parrot vacuous phrases and theses to make them seem important in global affairs. Consequently, Prabhakaran had a field day until the GOSL forces crushed the LTTE outfit comprehensively. That put an end to the violations of international humanitarian law once and for all. President Mahinda Rajapaksa achieved what all the forces of the West and India could not achieve for 33 years. But who gets the prize? Radhika Coomaraswamy is awarded the Chirac Foundation prize for writing some inconsequential notes on a paper whereas President Rajapaksa who ended a 33-year-old war and gave durable protection to the children is accused of violating human rights. The news item on Coomaraswamy said: “During her mandate as Special Representative she put in place 17 action plans for the eradication of the use of child soldiers around the world. She also contributed to the recognition, at the International Criminal Court, of individual criminal responsibility of those recruiting or using child soldiers.” We can congratulate her for putting down on paper “17 action plans for the eradication of the use of child soldiers around the world”. But can she tell us which one of the 17 action plans stopped Prabhakaran from the use of child soldiers? Has any of her action plans “eradicated” the use of child soldiers, as she claims? If she has “eradicated” the use of child soldiers with her paper plans shouldn’t she be given the Nobel Prize and not the low-grade Chirac Foundation prize? All her action plans have not even impacted on her fellow-Tamils to name and shame Prabhakaran. On the contrary, they have glorified the Tamil mass murderer as their greatest “liberator”. Where does this leave her “17 action plans”? Will she now speak out openly against Tamil violence and the recruiting of Tamil children without equivocation? Will she direct her operations from now on at the ICES – her first pro-Jaffna Tamil ideological base that led to the recruitment of Tamil children – to end the bogus cry of Jaffna Tamils not having dignity, equality and self-respect and work for reconciliation and peace? In fairness to Ms. Coomaraswamy it must be mentioned that she is not alone in this comic, topsy-curvy world. The European Union, warmongers who sent troops and/or flew planes in conflict zones killing innocent civilians in the Middle East, is the latest recipient of the Nobel Peace Prize. Then there is President Obama, the Commander-in-Chief of the mightiest power on earth who has killed more civilians than George Bush, being awarded the Nobel Peace Prize for his rhetoric. There is nothing on the ground to back up their contributions for peace, or protection of children. American Presidents, EU and UN “booru-crats” have only to talk or write to get awards. But those who restore peace on the ground, however costly it may be – peace is invariably won at great costs – are threatened with punitive action. It would be interesting to watch how the values expounded by Ms. Coomaraswamy gets translated into action now that she has left the UN ivory tower and entered the real world. Prabhakaran scorned bigger powers than Coomaraswamy because he did not face any punitive action for violations of human rights when he was wielding power. The West went along with him like the way they went along with the fascist dictators of the world who were useful to them. Their double-standards strengthened the power of Prabhakaran to enforce his tyrannical rule. The West was legitimising his killings by sending their diplomats to pay homage to him at a time when he was going on his killing spree. For instance, they knew that Prabhakaran had blown up the twin towers of the World Trade Centre and the Galadari Hotel on October 15, 1997, killing 12 civilians and injuring 113. This was done four years before Osama Bin Laden blasted the World Trade Centre in New York. No one in the West sent their diplomats to negotiate with Osama. Instead Obama sent his trained killers to shoot him dead in the presence of his wife and children – no questions asked. To impress that he is a no-nonsense Commander-in-Chief of American forces, Obama told his TV audience in the second debate with Mitt Ryan just last week, that no one can “mess around with American interests” without facing the wrath of the world’s biggest power on earth. It is the half-hearted approach of the West that kept Prabhakaran in the seat of power. On the one hand, they banned him and on the other they sent Erik Solheim to negotiate with him. Neither strategy worked. Taking Prabhakaran out of the political equation was a sine qua non for the restoration of peace. His presence was a threat to regional and global peace. GOSL was in reality fighting India’s war. The victory of the GOSL was a victory for the global war on terrorism. So if President Obama was given the Nobel Peace Prize before killing Osama Bin Laden shouldn’t President Mahinda Rajapaksa deserve the same prize after eliminating the Sri Lankan equivalent of Osama? Besides, Obama’s killing of Osama did not bring peace. On the other hand, Rajapaksa’s elimination of Prabhakaran has restored peace and saved the lives of thousands of Tamil children which Ms. Coomaraswamy’s 17 action plans failed to achieve. On balance, isn’t the saving of lives and protecting the childhood of underage soldiers worth universal commendation, as stated in the first resolution passed by the UNHRC? 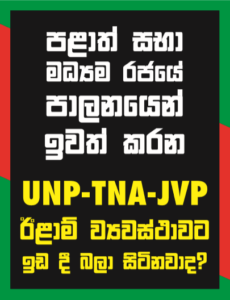 What then was the rationale for pursuing a vindictive political agenda to hold Sri Lanka accountable for saving peace, children and lives of all communities as seen in the second and third resolutions brought up in UNHRC? The third resolution sponsored by the US is as hilarious as Obama, EU and Coomaraswamy winning awards. Please don’t fall off the chair while reading the humbuggery in the preamble to the third resolution which states “that States must ensure that any measure taken to combat terrorism complies with their obligations under international law, in particular international humanitarian law, refugee and humanitarian law, as applicable…” When and where did US, and EU and India which backed this resolution, comply with IHL in combating terrorism? Has US applied it in the Middle East? Has India applied it in Kashmir?So why did US, EU and India decide to apply standards of IHL to Sri Lanka when they have not observed it in their battles against terrorism? UN High Commissioner for Human Rights Launches a Major Assault on Sri Lanka’s Sovereignty and targets the Defence Forces that defeated the LTTE, the World’s Most Brutal Terrorist Organisation.